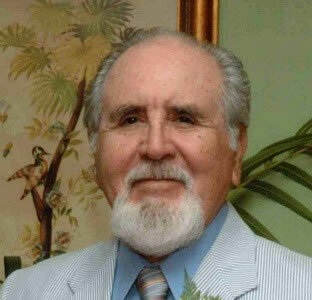 (July 27, 2012) -- Jacinto Quirarte, UTSA professor emeritus of art history, died July 20 at age 80. A memorial service will be at 3 p.m., Friday, Aug. 3 at Our Lady of Guadalupe Church, 13715 Riggs Road, Helotes. An expert in pre-Columbian and Latin American art history, Quirarte joined UTSA in 1972. At the time, he was an associate professor at UT Austin and was recruited by noted author and educator Tomás Rivera, who was an administrator at UTSA from 1971 to 1978. "Tomás told me about UTSA; I had never heard of UTSA," Quirarte said in an interview last year. "In fact, I asked him, 'Is there such a thing?' He said, 'Yes, we're starting a new university.' I was quite intrigued because it was the opportunity to get in on the ground floor of something." Quirarte became the founding dean of the College of Fine and Applied Arts and served in that role until 1978. He retired from UTSA in 1999, but continued to teach seminar courses at the university until 2008. He also continued to research and write: he was profiled in Sombrilla magazine in 2003 following the publication of his award-wining book "The Art and Architecture of the Texas Missions." Most recently, he was one of the founding members of the UTSA Retired Faculty Association, which was established in 2011. "With Jacinto's passing, UTSA has lost one its most remarkable founding figures," said Dan Gelo, dean of the College of Liberal and Fine Arts. "He was our first fine arts dean, laying the groundwork for today's excellent programs, and in recent years, he was delighted and a little surprised at all that developed from his early labors. My finest memories of Jacinto come from the few times I shared the podium with him at scholarly conferences -- that's where he was most in his element. Nowadays, there is lots of excitement surrounding pre-Columbian art and the architecture of the missions, but it was Jacinto who led the movement to have these subjects included in the art history mainstream, and that is a profound and lasting legacy." In lieu of flowers, memorials can be given to the Jacinto Quirarte Endowed Scholarship in Art History by checks payable to UTSA and mailed to the UTSA College of Liberal and Fine Arts, Office of the Dean, One UTSA Circle, San Antonio, Texas, 78249-0641.